Weave spiritual values into your daily life. Deepen your understanding and compassion. Become aware of and trust your experience of God. Share challenges, disappointments and grieves. Appreciate life as a blessing in the midst of struggle. Nurture your relationship with God, others and creation. Live into the freedom of who you are. There is a longing in every human heart to be fully alive. Do you feel disconnected? Do you need a spiritual tune-up? Are you just going through the motions, is your focus unclear and stress getting the upper hand? Have you asked these questions: “I wonder where God is? Why can’t I be more spiritual? I wish I knew what I should be doing with my life?” When life begins to feel unbalanced, and your joy and enthusiasm are drained by an emotional fatigue you cannot name – it’s time to take action! A Spiritual Director is willing to walk alongside of you, to help you see where you are called to be in this time of your life, to help you encounter God in unexpected places and circumstances where you did not expect to find God. You are not alone! A Spiritual Director is a compassionate friend who accompanies you, walks with you, loves you, cries with you, and laughs with you. Spiritual Direction is a way of leading us to see and be attentive to the real Director – the Spirit hidden in the depths of our being. As we become attuned we can more easily utilize resources God has already given us. We can trust our experiences and decisions make a difference in our life. We get to live from the beauty of who we are! A Spiritual Director listens for the movement of the Divine within you and encourages you in how to work with the Spirit. The blessings are clarity, focus, stability, peace and a lightness of heart. Pr. Margareta Dahlin Johansson was selected by the Diocese of Stockholm to be trained as a Spiritual Director in 1996. This complemented her ministry as an ordained Hospital Chaplain at the Karolinska University Hospital from 1977-1998 where she was a Senior Chaplain with a special focus on Women and Children. She is also a graduate of St. Luke’s Institute in Stockholm with a Diploma in Therapy. She has co-authored three books: “Children’s Existential Questions: How they Understand their Diseases and Dying“; ”Ethical Issues Related to Abortions” (Commissioned by the Church of Sweden); and “Egg Donations: Ethical Perspectives related to Artificial Insemination“ (Commissioned by “Save the Children” Sweden). She was a Founder of the Forum for Medical Ethics (1992-1998) – an interdisciplinary work group of physicians, nurses and theologians at the Karolinska Hospital. Pr. Margareta has provided Pastoral Care in congregations in Ann Arbor, Michigan and Danville, California. She can work in both English and Svenska/Swedish. Contact Pr. Margareta at 925-648-7004 or email margareta@peacejourney.org. The person seeking Spiritual Direction determines the focus. It could be exploring a dream or critical issues, discerning life choices, finding ways to pray that connect you with God, or simply responding to a longing of the heart. The spiritual director/companion is present to you through attentive listening, evocative questions, and caring support. Within a safe environment one can freely and prayerfully become aware of where God’s spirit is leading. Spiritual Direction opens the pathway to who you are so you can build your life on what you love. Pr. 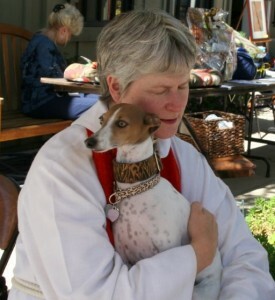 Margareta at our Annual Pet Festival and Blessing of the Animals.